Ministry of Supply 'Austerity' type 0-6-0ST, built as Hunslet No.3163 of 1944 for the Ministry of Supply; it became War Department No.75113 and worked at its Bicester base. Post war it became Army Deprtment No.132. In 1950 the loco was transferred to the Cairryan Military Railway, Stranraer then to the bases at Longtown in 1952, Bramley 1955 and Bicester again in 1957 (named 'Sapper' in 1959). In 1962 the loco was returned to Hunslet who rebuilt it in 1964 as No.3885 with a mechanical underfed stoker, a gas-producer system and four-jet Kylpor blast-pipe with stovepipe chimney. It then went to the National Coal Board and worked at Coventry, then the NCB Walkden workshops 1966 (as 'Alison), and collieries at Gresford 1970 and Bold 1974 (as 'Joseph'). 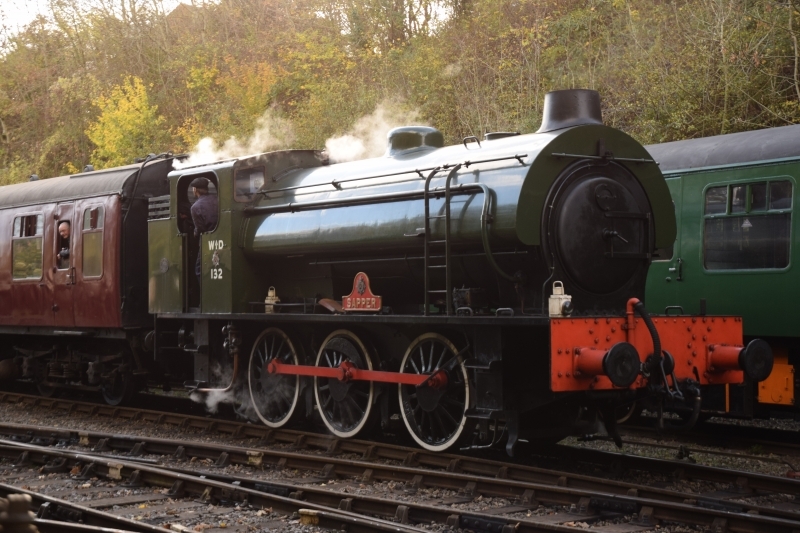 It was one of the last working steam locomotives in the UK. It is seen departing Bitton on a service for Oldland Common during the Avon Valley Railway Autumn Gala, 4 November 2017. At the gala the loco performed impressively with rapid acceleration. Speaking to the fireman, he said it steamed so freely it was very difficult to prevent the safety valves lifting (which the did several times! ).